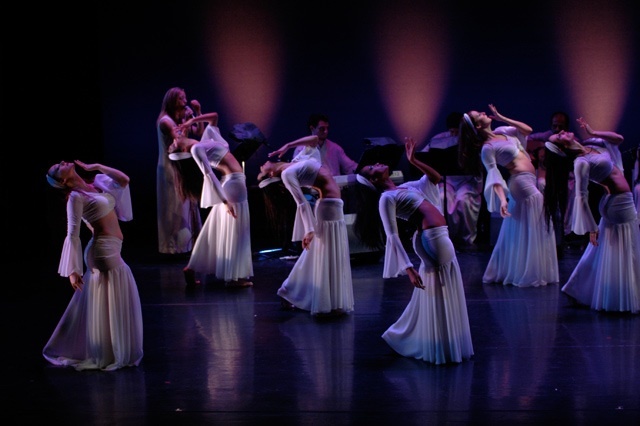 Photo by Sussi Dorrell courtesy of Arabesque Dance Company. DANCE: Members of the Arabesque Dance Company perform at the Revival Bar tonight in a fundraiser for the Crohn’s & Colitis Foundation of Canada. As one of the leading belly dance organizations in the country, with an international reputation garnered from its world-wide tour circuit, the Arabesque dancers are surely a big draw, as is DJ Agile, a Toronto-based DJ and producer, who’s created beats for big names like Jully Black and Nas. The ticket price includes a comp beverage, hors d’oeuvres, dessert buffet, and a gift bag. Revival Bar (783 College Street), 7:30 p.m., $40 in advance, $45 at door. MUSIC: A much under-hyped show at the WhipperSnapper Gallery this eve showcases three bands that craft dreamy atmospheric pop. Headlining is the long-running, sixteen-year-old band Windy & Carl, comprised of real-life couple Windy Weber and Carl Hultgren, who rarely tour as they run a record store in Dearborn, Michigan, that doubles as an artistic hub. Next up is Benoît Pioulard, the deceptively French pseudonym for Oregon artist Thomas Meluch. Lambs Laughter, a promising new collaboration between Weber and Meluch, opens the night. WhipperSnapper Gallery (587A College Street), 8 p.m., $12. POETRY: The Toronto Poetry Project is hosting its popular poetry slam at the Parkdale Public Library tonight. Audience-performer interaction is a must here: each performance is audience-rated with the highest ranked advancing on to compete for the ultimate cash prize. Audience members can also compete alongside poetry slam veterans, such as spoken-word poets The White Noise Machine (a.k.a. Mike Smith) and Krystle Mullin, both of whom have represented Toronto at the Canadian Festival of Spoken Word. Parkdale Public Library (1303 Queen Street West), 6 p.m., FREE. DESIGN: The YES 2009 Design Grad Show, whose moniker stands for the simple and straightforward Year End Show, streamlines the best student work from George Brown’s design programs (Game, Exhibition, Corporate, Advertising, Advanced Digital, and Design Management) into one exhibition. The works are on display at the department’s new home until April 28, but tonight’s opening reception will have some of the featured designers in attendance, along with food, drinks, and DJ trio The In Crowd spinning Motown, funk, and other oldies. School of Design (230 Richmond Street East), 6 p.m., FREE but RSVP in advance at [email protected].